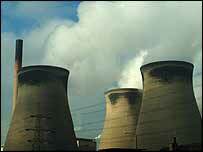 A West Yorkshire power station has been named as the top polluter in England. Campaigners Friends of the Earth claim AEP's coal-fired station at Ferrybridge is among the most inefficient in the UK. The league table was published by the group to mark the launch of its Carbon Dinosaurs campaign. A spokesman said coal-fired stations pump out three times as much greenhouse gases as new gas-fired stations. The campaigners are concerned about global warming and say the carbon dinosaurs have no place in a modern, clean energy system. Scottish Power's Cockenzie plant tops the overall league table of inefficiency, which was compiled from data provided on the UK's 16 coal-fired stations. The pressure group said it produced the highest level of carbon dioxide per unit of electricity last year. Duncan McLaren, of Friends of the Earth, said: "Our climate is changing as a result of pollution. "Along with other measures, greenhouse gas emissions from our inefficient and dirty coal-fired power stations must be cut. "The Government must make the worst offenders clean up or get out of the market to make way for less damaging alternatives." Staff at the power station said no-one was available for comment. But David Porter, chief executive of the Association of Electricity Producers, responded to the report by saying: "The UK electricity industry has an excellent record of reducing emissions of carbon dioxide and there is more to come. "A huge programme of renewable energy is being developed; gas-fired power stations have replaced many coal stations and a new EU carbon emissions trading scheme is about to be implemented. "But, suddenly to close more coal-fired power stations would be catastrophic. "They make a big contribution to security of supply and the margin between generating capacity and customers' demand is already very tight. "It is important to keep the lights on as we progress towards a lower carbon economy."